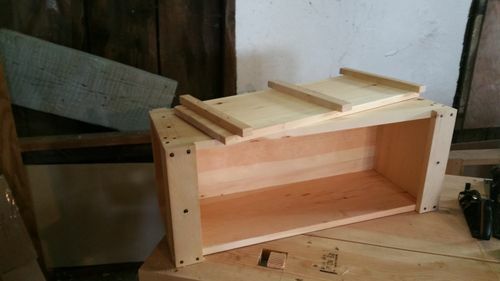 I am building an English workbench via the English Woodworker. Not quite finished, but enough that I could build a Japanese tool chest for my planes. Looking good, David. By mention of the English Woodworker, may I assume you are an unplugged handtooler? Thanks. I am attempting to remain unplugged, though I do have a few power tools, and they will remain. I have sharpened up a number of bladed tools in the last six months, and really enjoy using them. When the bench is finished, I will have a proper space to work with them. My plywood outfeed table doesn’t have the weight behind it for much work. The tool chest is already full of planes and chisels. Well … I won’t hold a few power tools against you. LOL! I look forward to what comes off of this bench. Good luck in your attempt to remain unplugged. 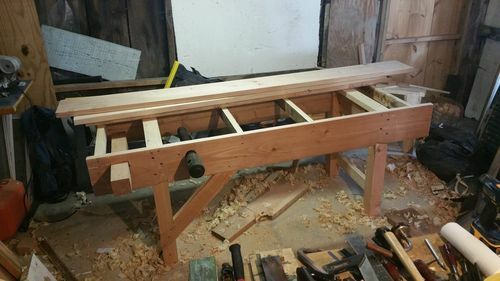 I built the bench with hand tools, and have a list of project ideas I want to get through. 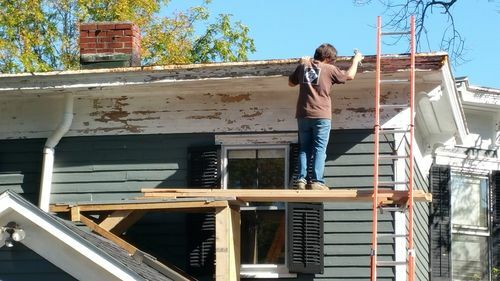 When I built the scruffy scaffold over the back room to paint the house, though, I was concerned with getting it done so the paint went on before the snow. Skil circular saw, ryobi drill. They have their use, for sure, and though I am attempting to stay hand powered in my ‘real’ projects, the mundane stuff needs doing too. By the way, I reused the boards from the scaffolding to build the bench. I hope to post items worth looking at as I progress in my skills! They have their use, for sure, and though I am attempting to stay hand powered in my real projects, the mundane stuff needs doing too. David, I would not attempt house repairs with out my few power tools, as well. I have the the usual suspects; drills, circular saw, jig saw … they just never see the inside of my shop! They rest quietly in the garage waiting to be used around the house. Believe it or not … outside my shop … I am of this century. LOL! Great work bench. I built several of the Japanese tool boxes for Christmas one year. They were pretty fun to do.